Chestnut Leather with Floral tooling is a rich backdrop for the Pink Crystal trim and hand-painted Pink Ribbon, the symbol of the Susan G Komen Breast Cancer foundation. Hand-tied crownpiece with buckle adjustment, halter bolt tie down ring attachment. 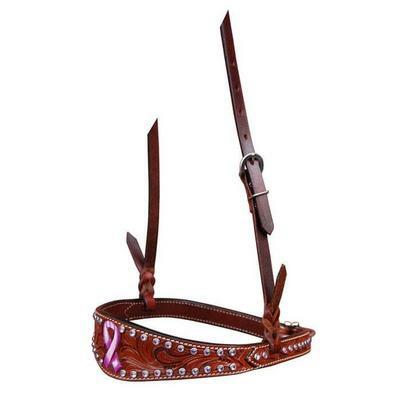 Matching tack and spur straps available. Hand painted pink ribbon motif. Hand tied crown with buckle. Halter bolt tie down ring attachment.